It’s no secret that economicturmoil and extreme uncertainty in Greece pose major threats to the global economy. Barring several setbacks and challenges, namely from Greece’s left-wing government, Eldorado Gold Corp. offers great potential in the country, as it has given itself the ammunition to achieve success in the near future through its gold projects. Eldorado owns three gold projects in Greece: Olympias, Skouries and Perama Hill , along with an operating zinc mine called Stratoni. 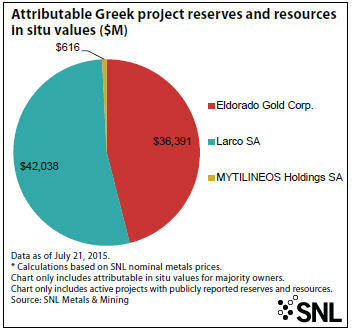 The company’s strong Greek presence doesn’t end there; among the seven companies that SNL tracks with projects in the country, Eldorado comes in second with $36.39 billion in reserves and resources in-situ value. The other companies combine for $43.90 billion. Larco SA, the company with the largest in-situ value, owns an open pit nickel mine called Larco Nickel that has 2.5 million tonnes of contained nickel reserves and resources, although only 353,000 tonnes are classified as reserves. While the reserves and resources were last reported as of 2006, SNL has estimated Larco Nickel’s production at 18,000 tonnes for 2014. Additionally, Greece accounts for the largest chunk of Eldorado’s reserves and resources in-situ value, highlighting their commitment to future production in the country. Turkey comes in second place at $21.01 billion in reserves and resources in-situ value. Together, the Olympias, Skouries and Perama Hill projects account for 8.5 million ounces in attributable gold reserves, followed by the Kisladag mine in Turkey with 8.1 million ounces. However, unlike the Kisladag mine, which is expected to close in 2020, the Olympias and Skouries mines are projected to be operating until 2040 and 2043, respectively. 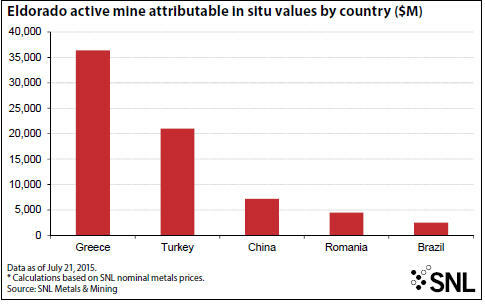 SNL data also captures zinc and copper reserves in Greece for comparison’s sake. The 950,950 tonnes of attributable zinc reserves and 728,650 tonnes of attributable copper reserves represent a much larger but less valuable portion of Eldorado’s operations in Greece. Clearing regulatory hurdles will allow Eldorado to move forward with the Skouries project, which together with Olympias will offer new opportunities for both the company and Greece. Eldorado already invested $450 million between these two projects and is not backing down despite risk in the country. The company’s Investor Presentation from June highlights that it continues to employ over 2,000 people in Greece — where unemployment figures remain north of 25% — and that it will pay at least $1 billion in taxes to the Greek government over the next two decades. SNL data illustrates the stark contrast of Eldorado’s attributable in-situ values for gold, zinc and copper projects, which represent some of the company’s primary commodities. Stratoni, the company’s only operating zinc mine in Greece, has an in-situ value of $164.2 million based on its total attributable reserves and a nominal zinc price of $2,161/tonne. Skouries provides the company with an in-situ value of $4.58 billion in copper reserves based on a nominal price of $6,283/tonne. Conversely, Eldorado’s three gold projects account for $9.74 billion in attributable in situ value, based on a nominal gold price of $1,150/oz. These figures — combined with the fact that there are only 76,000 tonnes of attributable zinc reserves at Stratoni, make clear the rationale behind Eldorado’s continued commitment to its Greek gold projects despite the country’s ongoing financial crisis. Eldorado can expect to see a substantial increase in Greek gold production starting in 2016 when phase two construction at Olympias is complete and in 2017 when Skouries commences production. By 2020, Eldorado has estimated 123,420 equivalent ounces of annual gold production at Olympias alone.